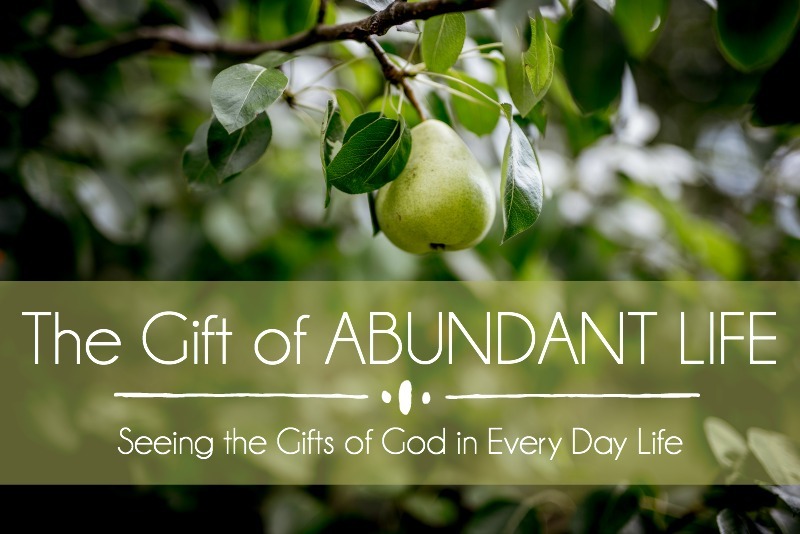 Obviously in a series about Lopsided Living, the first real post is about the gift of ABUNDANT LIFE, right? But here’s what I’m thinking — we are thankful for our lives. But I also know sometimes I miss living in the fullness of life God offers because I’m so caught up in the mundane and messiness of my day-to-day living. And, it’s possible you do too. Hence today’s invitation to see ABUNDANT LIFE as an every day gift from God. For each of the twenty gifts we’ll cover this month, you’ll have three tasks — observe, reflect, and respond. We’ll begin by observing what God’s Word says. Next, we’ll spend reflect on how we can notice the gift in our every day life. And finally, we’ll respond with a short prayer. This process may feel a little odd to you at first but, trust me, within a few days this way of paying attention, seeing God’s gifts in our lives, will feel like second nature. Jesus said, “A thief comes only to steal and kill and destroy. I have come so that they may have life and have it in abundance” (John 10:10). Are you living in abundance? Our enemy wants us to be distracted by all we don’t have, all that’s missing in life. His purpose is to steal our joy, to kill our faith, and to destroy our hope. In my life, I’ve seen this happen when I’m tired or weary or sometimes it happens when I get distracted by comparison or even competition. 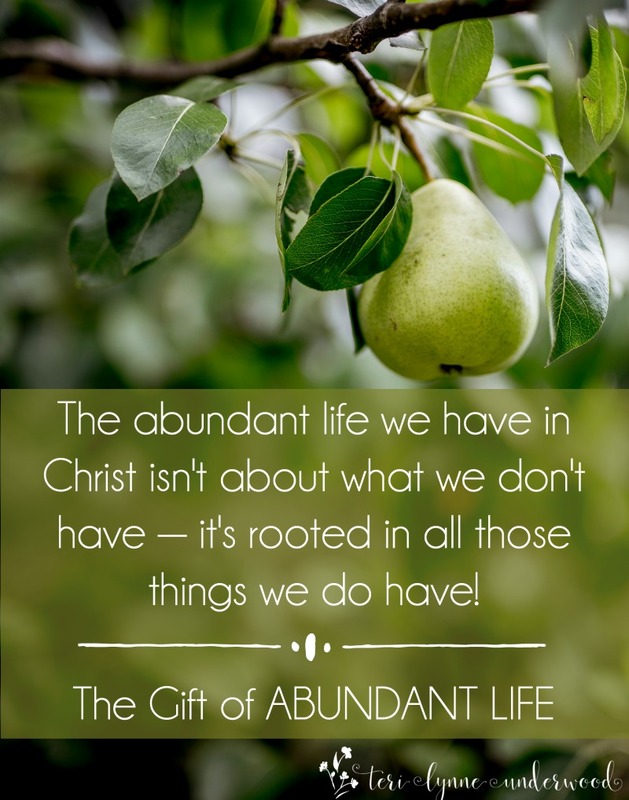 But the abundant life we have in Christ isn’t about what we don’t have — it’s rooted in all those things we do have! After reading through the verse a few times, how do you see God’s gift of abundant life in your own circumstances? What are some of the ways you can be distracted from seeing or seeking the full life we have in Christ? What specific actions can you take to safeguard against this tendency? 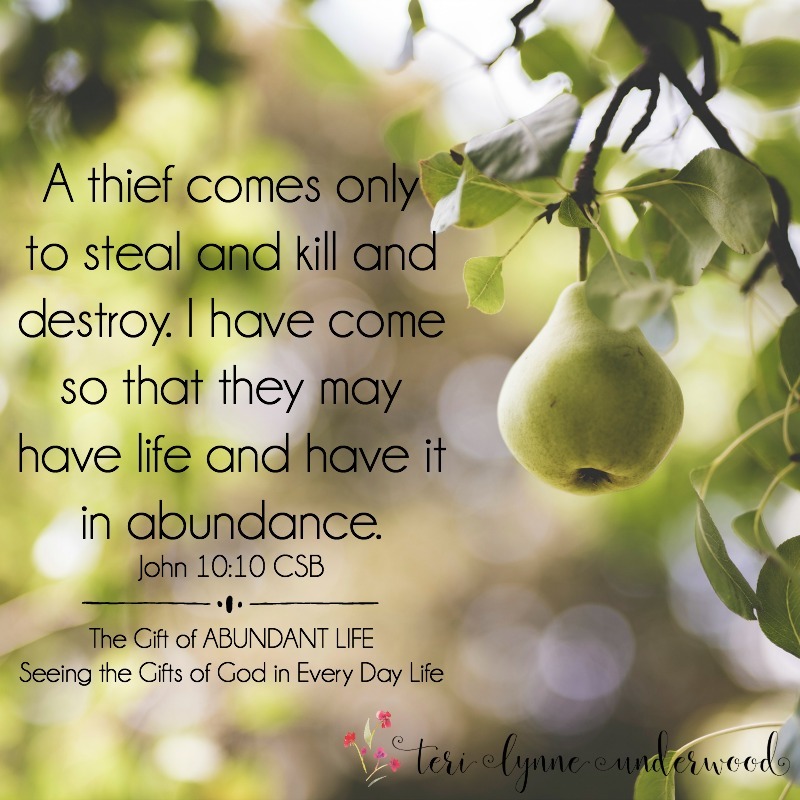 Lord, so often we allow the enemy to distract us from the truth of the abundant life we have in you. Will you help us realign our hearts to your truth? Give us wisdom to see your generous provision in our lives. Teach us to live with a mindset of abundance not scarcity. And as we do, Lord, will you grow in us a passion to live the full, over the top, overflowing, abundant lives you have promised to us? In Jesus’ name, Amen. Every day, I’ll be sharing a book, article, or other idea for digging deeper into the topic. Today’s resource is Tricia Goyer’s brand new book, Walk It Out: The Radical Result of Living God’s Word One Step at a Time. Every experience of her life, from teenage mother to adoptive mother of seven has led Tricia to this one truth — it’s not enough to know God’s Word, we have to DO what it says. Sharing her own journey to walk out what she was learning in the Bible, Tricia invites all of us to begin our own journey of walking out what the Bible tells us. For many, this challenge will feel scary and overwhelming. Tricia doesn’t shy away from the difficulties this kind of obedience can bring. But she doesn’t leave us there. She offers us a living example in her own life of how the hard decisions are the very place we find God to be the most present and faithful. If you’ve been a believer for decades but always had this niggling thought there must be something more, this book is for you. And if you’ve just encountered the Bible and wonder what happens if you actually do what it says, this book is for you. And if you are anywhere in between, this book is for you. I highly recommend Tricia’s book as a guide for all of us who want to live out what we’re reading in the Bible — and as we do, we too will experience the abundant life He offers! That was VERY encouraging and something I needed to hear. I do not live an abundant life. Thank you so VERY much for your encouraging words. I appreciate you so much!